Name tag sticker, "I Am Bug Girl"
Gotta love that Bug Girl. Oh, sure, there are lots of bug girls and bug boys out there--bug women, bug men and real insects, too--but there's only one Bug Girl. She's the one who writes that witty/informative/tell-it-like-it-is-not-what-you-want-it-to-be bug blog called...drum roll...Bug Girl. 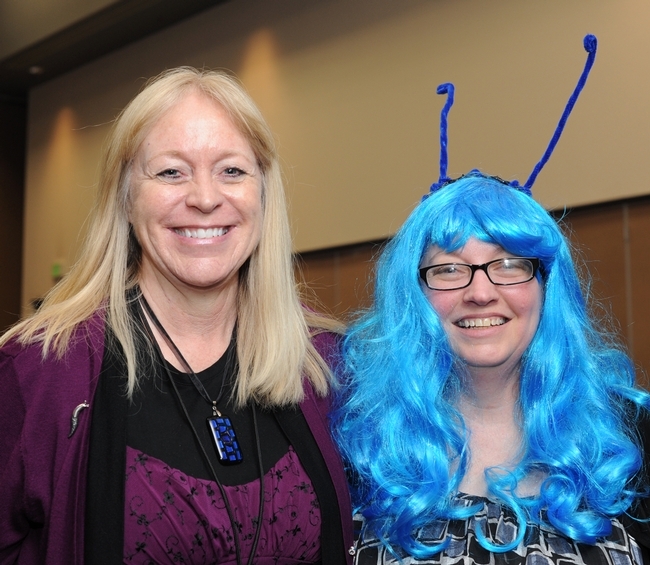 Bug Girl, aka Bug C. Membracid, spoke at a social media seminar at the 59th annual meeting of the Entomological Society of America, held Nov. 13-16 in Reno. Before her talk, folks were sporting "I Am Bug Girl" stickers on their name tags. That added to the mystery of "Who is Bug Girl?" That one? This one? The one over there? Will the real Bug Girl please stand up? See, she writes anonymously. 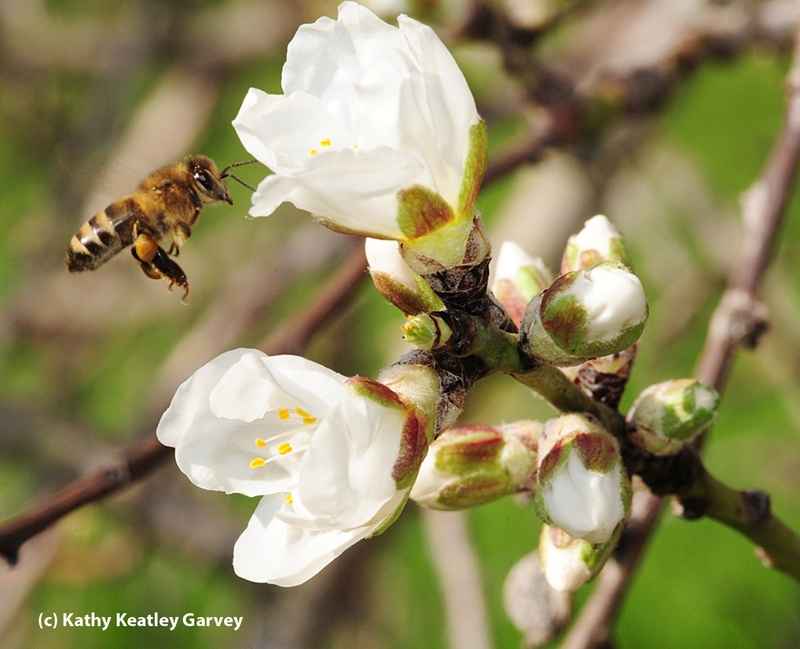 We don't know who she is--she keeps her identity a secret--but we do know she has a doctorate in entomology from North Carolina State University and she works in a provost's office "in a Connecticut university." 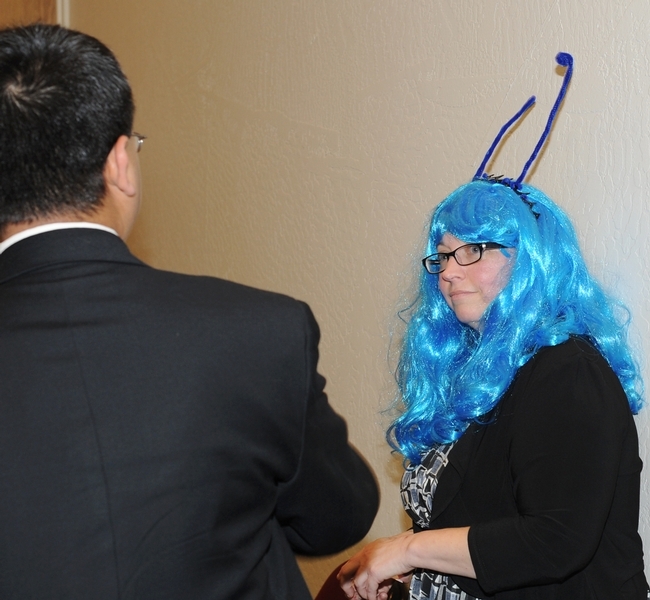 We also know she wears a mop of hair the color of a blue morpho butterfly and some cool (and mostly erect) blue antennae--at least she did at the ESA meeting. We also know she has a fan base like you wouldn't believe. Fellow bug lovers were coming out of the woodwork like termites to hear her speak, hug her, and to be photographed with her. Move over, Angelina Jolie. Take a seat, Taylor Swift. Scoot, Jennifer Aniston. We have a scientist in our midst! In her talk, "Adventures of Bug Girl or Everything You Wanted to Know About Entomological Social Media But Were Afraid to Ask," she told how you, too, can become "an online entomology goddess." She began blogging as Bug Girl in 2004, as "a way to become a better writer." Bug Girl writes the way she talks. No academic jargon, nothing you have to read three times to understand. "it's about talking to people; it's about conversation, not lecturing," she said. However, Bug Girl warned "people can be very cruel to you." Someone even set up a website countering her views, she said. 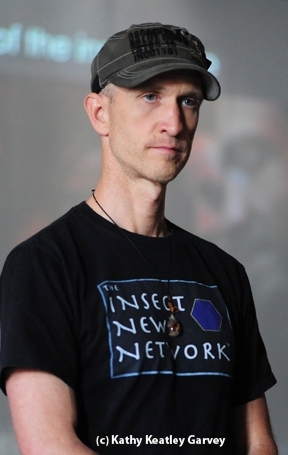 She also mentioned her bug-blogging buddies, including Dragonfly Woman, Alex Wild (he received his doctorate in entomology from UC Davis) and Carl Zimmer, among others. "I don't see us as competitors, but as collaborators," she said. "It's not about who has the most followers." "What I do isn't so much as public outreach; it's public engagement. It's having a conversation with our readers." Bug Girl said she's proud of what she called "the little victories," like convincing Nature journal to spell "bed bug" as two words, instead of one. She bashes bad science like some folks bash cockroaches. 1. Find your niche or what she called your "blue water" or where few are--and not "red water," because that's where the sharks are. 2. Find your voice and make it distinct. Don't look for validation or positive validation. 5. Don't expect a profit. For all bloggers and would-be bloggers, Bug Girl recommended folks read David Meerman Scott’s The New Rules of Marketing and PR. For the full account of what Bug Girl said at the ESA meeting and what bugs her, link here.